Gwen Cates, a painterly realist colorist, does plein air oil paintings on California Central Coast ranches and vineyards. A native Virginian, she moved to Santa Ynez in 1999 with her husband, winemaker, writer and photographer, Bill Cates. Gwen has had gallery exhibits in Charlottesville and Roanoke, Virginia; in London, England; Washington D.C.; Pittsburg, Pennsylvania; and in Los Angeles and Santa Barbara, California. Her most recent gallery exhibits were at Gloria Delson Contemporary Arts and Gallery Bleu in Los Angeles, and The C Gallery in Los Alamos. 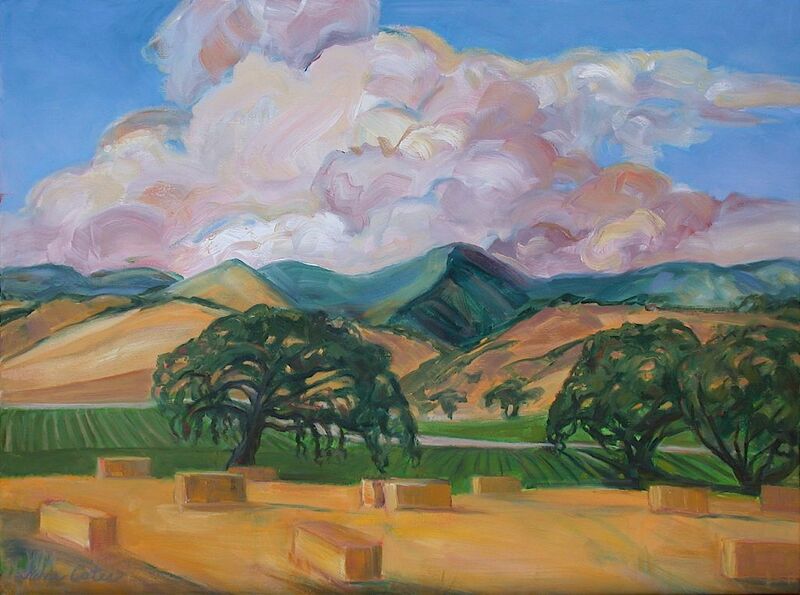 She is on the board of the Artist Guild of the Santa Ynez Valley and is Chair for Artist of the Month exhibits. Gwen was recently selected by Art2Business to exhibit paintings in participating Santa Barbara businesses. Gwen Cates says of her work: “My goal in painting is to have an adventure that I can share with others. I want the viewer to feel involved in the act of painting, to be aware of the brush strokes and the sensuousness of the medium as much as the subject matter of a piece. I enjoy painting wet on wet, sliding one color over the other to achieve richness and vibrancy. I like to take risks and make discoveries as I paint. Colors emerge that surprise me. Shapes become simplified, more abstract. I can say things with paint that I cannot imagine otherwise.